I was cruising the web last night and discovered that a t'ai chi ch'uan teacher with whom I studied many years ago had passed away at the age of 93. 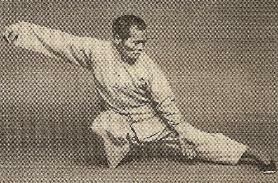 His name is Ben Pang-Jeng Lo and he taught the Yang short form as taught by his teacher, Cheng Man Ching. Regrettably, I only studied with him for a short time, but even then who he was had a great impact on me and what he taught brought great and countless benefits to my life. He was not only a t'ai chi master, he was also an excellent teacher, who refined five principles or areas of concentration when doing the t'ai ch form, which was The five principles are relax, separate yin and yang, turn from the waist, keep your hands in a posture called 'beautiful ladies hand,' and keep the body upright. These principles have been trusted guides in my practice. For all that he gave me, I simply want to express my deep respect and gratitude to this incredible individual and practitioner. Here is a picture of Ben which shows the level of artistry he had attained and that I really love.